As part of our collaboration with Georgia Tech, we’ve been developing various strategies for sensing fruit growing in trees. One of those has been to build an electronic nose that can smell fruit and alert us when it’s ripe. How do we do this? Ideally we’d sense ethylene since it’s produced as a by-product of ripening and also acts as a ripening agent. This is why people say put a piece of fruit in paper bag (optionally with another piece of fruit) to encourage it to ripen — you’re raising the local concentration of ethylene. 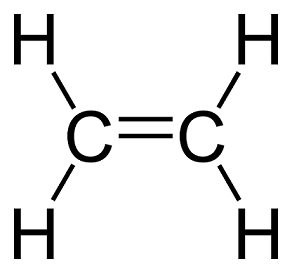 Ethylene molecule: 2 carbon atoms linked with a double bond. Each carbon has 2 hydrogen atoms bonded to it. Ethylene sensors are typically used in commercial fruit storage warehouses, so they’re large and expensive and parts-per-billion accurate. That won’t do for a small-budget project needing small sensors to give a basic “ripe/not ripe” determination. 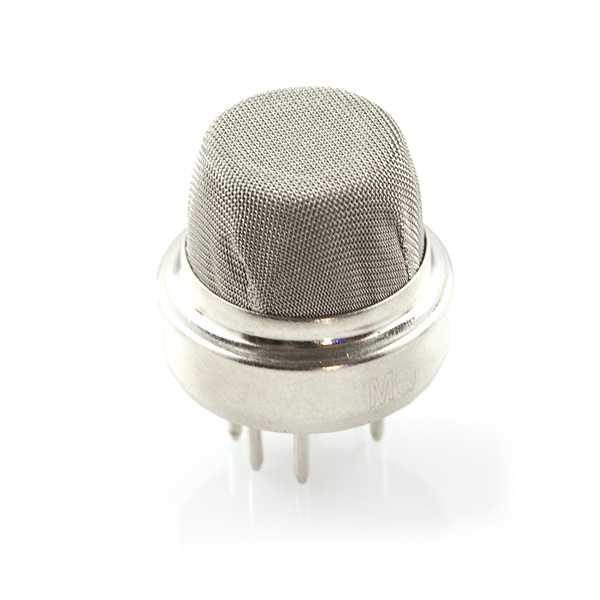 One option we have is semiconductor gas detectors. These are sometimes called tin dioxide sensors or Taguchi gas sensors. 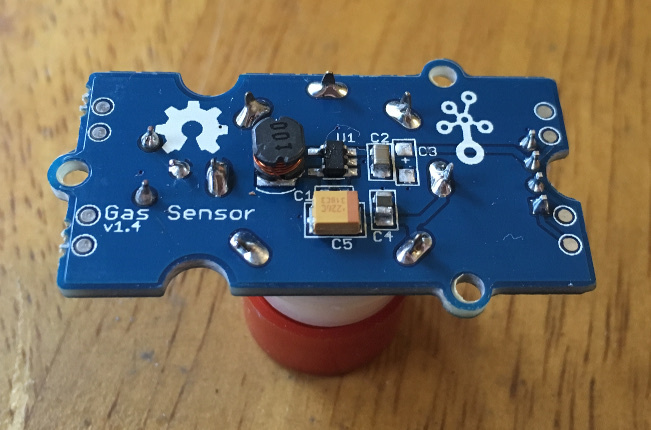 The basic principle of these sensors is that as oxygen attaches to the tin dioxide sensor surface it causes the electrical resistance of the sensor to increase. 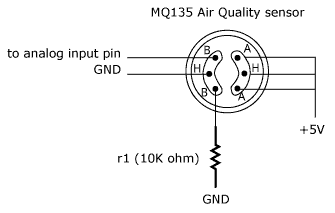 In air, the amount of oxygen doesn’t really change so the sensor should give a steady value. One could consider the sensor at this stage to be oxidized. Going back to high school chemistry, the opposite of oxidation is reduction, so these sensors excel at sensing reducing gases: those gases that remove oxygen from the sensor surface and cause its resistance to decrease. One way to remove oxygen is to react with it, and at that point we’ve arrived at combustion. When you’re combusting (or commonly known as “burning”) something, it’s reacting with the oxygen in the air and releasing energy to keep you warm, move a piston in your car engine or destroy incriminating evidence. That’s why when you shop for these types of gas sensors, your only options are combustible gases: hydrogen, propane, methane, alcohol vapor, volatile organic compounds, etc. And even though a sensor might be modified to be more sensitive to hydrogen, propane, or methane, its basic principle of operation dictates that it will react with other gases too. Our hope is that we can use this to our advantage since ethylene is combustible and chemically similar to ethane (which is in turn similar to methane and propane). There may also be other gases that are produced as fruit ripens that we are able to detect. 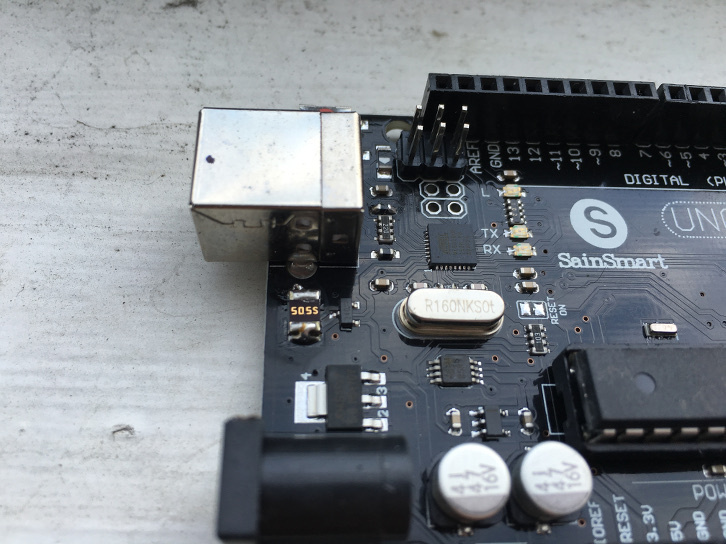 Arduino is not really an ideal platform for working with many of these sensors in large part because the power requirements for each sensor. Each sensor draws roughly 150 mA, so at 5V that’s 800 mW. According to the UNO’s schematic, the USB power supply on the Arduino has a 500 mA fuse on it, and the barrel jack voltage regulator can handle anywhere from 1000 mA to 2200 mA, but in order to produce 5V from the regulator, you need a minimum of 6.5V in. At 800mA of current, the regulator will have to dissipate a fair amount of power and will get quite hot. So we have to supply our own 5V supply for the sensors, which is totally doable, but it’s a bit of a pain: you have to get a 5V wall-wart and break out the +/- terminals. And you may even want a 6+V wall wart to run through your own regulator to limit voltage fluctuation. Not a huge deal, but it’s just a bit more distant from a typical plug-n-play Arduino application. 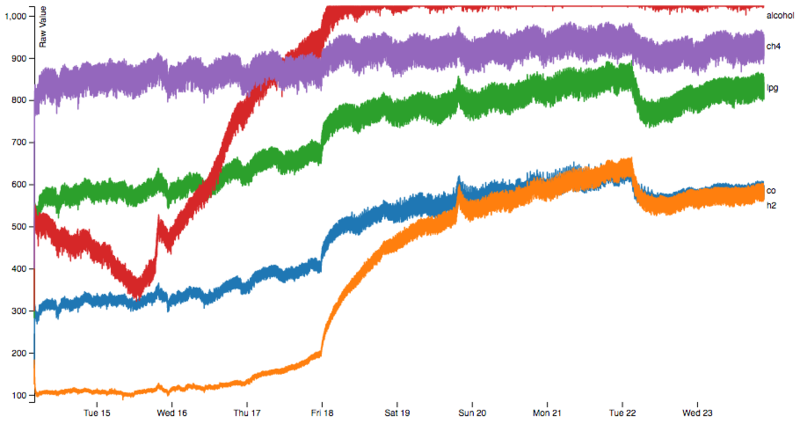 As an initial experiment, we put each sensor in a separate sealed bag and recorded the data for a few days to get an idea of their baseline data (assuming not too much off-gassing from the bags). Alcohol is probably broken in some way. Calibration could be a lot better. Methane hangs out in the 800’s the whole time and our maximum possible reading is 1023. This is probably a limitation of the circuit that will get better in version 2. Our sensors influence each other. 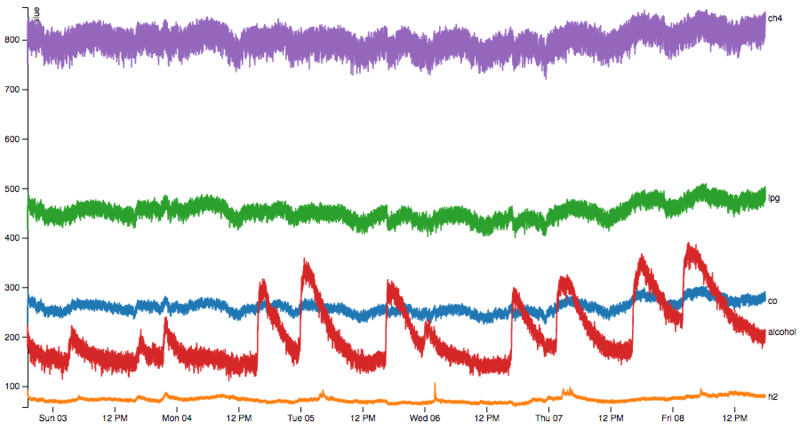 There are many peaks and valleys in the data that overlap exactly across sensors. That does not seem likely given that each sensor is in its own separate mostly-sealed environment. It’s only a version 1, but this is surprisingly worse than I would have expected. Let’s run some experiments with them and see how they do. The sensors were all placed in the bag and left running for a day so they could burn-in and be stable. After that, the banana was placed in the bag and the bag was sealed, leaving about 1″ unsealed to accommodate the sensor wiring. Our experiment took place over the course of 10 days and we had some reference bananas from the same bunch to compare visually during the experiment and to taste afterwards. 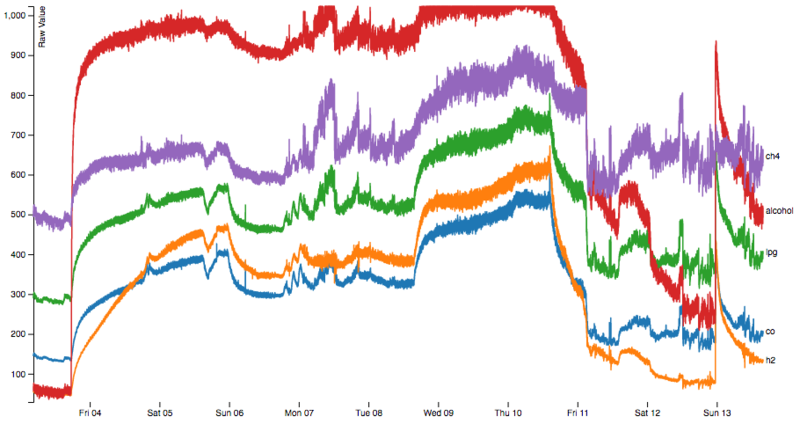 The first nice thing to notice about the data is that it points up and to the right. That’s super cool because it means we’re detecting something in relation to ripeness. But beyond that, we’ve got our usual problems. Since I obviously had some hard-to-diagnose electrical error in my wiring, I decided to try the Grove system out from Seeed Studio. 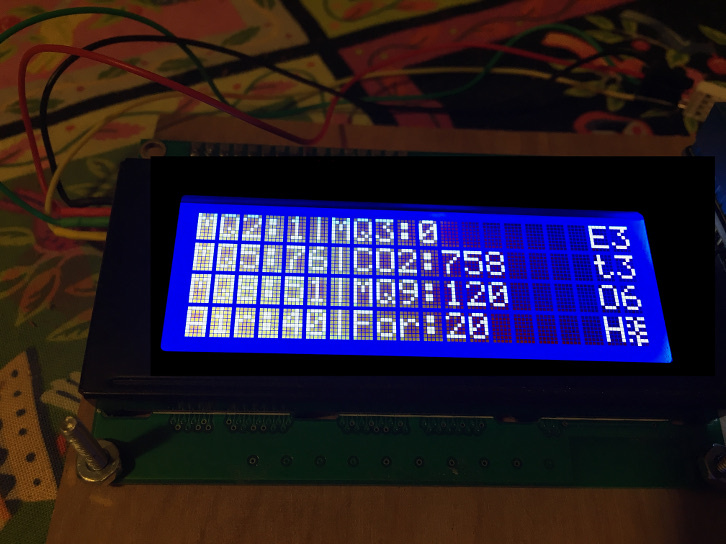 The nice thing about the Grove stuff is that it all uses 4 pin connectors and is designed for plug-n-play environmental monitoring. Unfortunately, none of this mattered because the sensors do not seem to be well-designed. They are nicer than my original setup in that they have a potentiometer on them to let you calibrate their output, but they also seem like they are just made wrong. When setting up this system I noticed that a certain sensor would short out the Arduino every time I plugged it in. This would happen even if I removed the actual gas sensor from the socket, so it was a problem in the breakout board circuitry itself. There’s not much to that circuitry except for a few capacitors, an inductor and an IC. That IC (only labeled in the EAGLE part info) is an ETA1036 step-up voltage converter. The datasheet is super short but it makes one thing clear: max input voltage of 4.5V. This means don’t recommend people connect 5V to it on the Seeed Studio wiki. Okay, so we got some promising data but overall, a bit of a bust so far. Version 2 is right around the corner though, and should improve a lot of these problems. Anyone have an idea of what this is? We found it last weekend while picking apples.